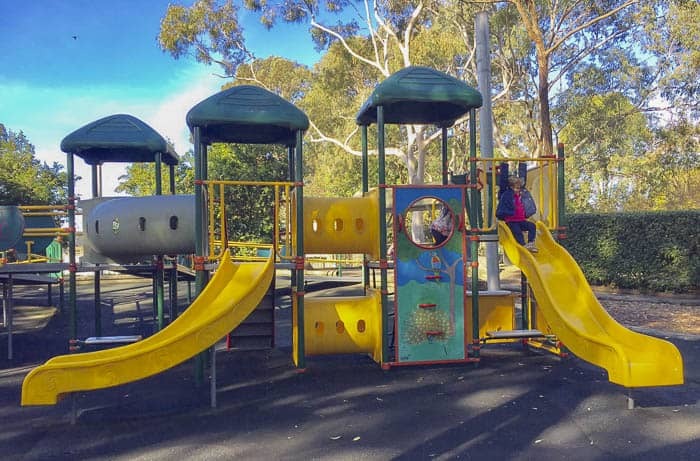 Auburn Botanic Gardens: Japanese Gardens, Fauna Reserve, Playgound! 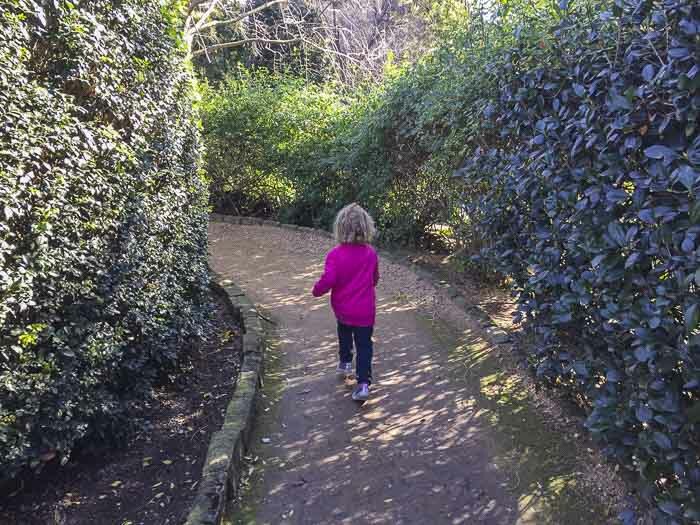 Home » Best Sydney Bush Walks: Find Fab Sydney Walks Here » Auburn Botanic Gardens: Japanese Gardens, Animals, Theatre, Lakes and more! 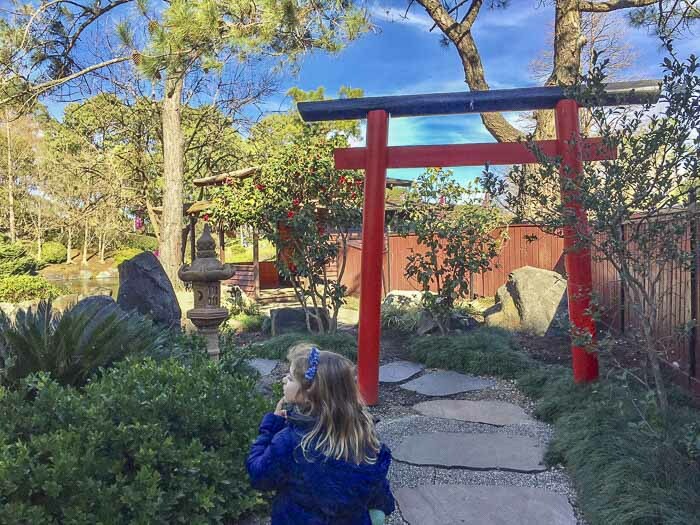 Auburn Botanic Gardens: Japanese Gardens, Animals, Theatre, Lakes and more! Sydney is full of beautiful surprises, and Auburn Botanic Gardens is one of those. 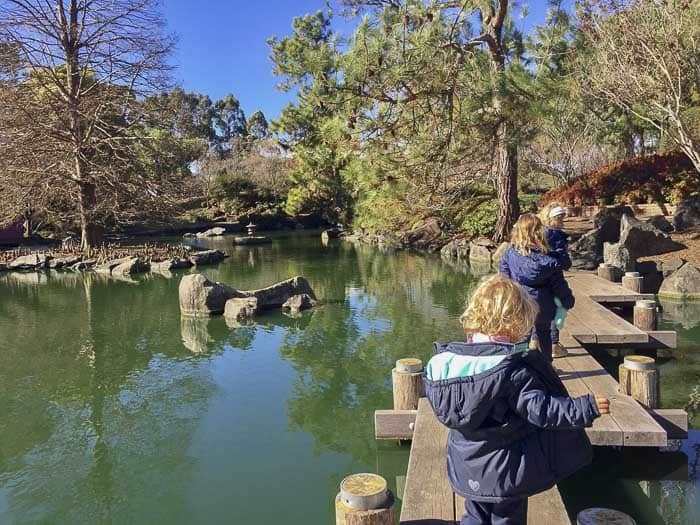 It has one of the most beautiful Japanese gardens in Sydney, a fauna reserve, a playground, maze, picnic areas and more. Cherry blossoms from the National Trust Auburn Botanic Gardens site, many thanks. 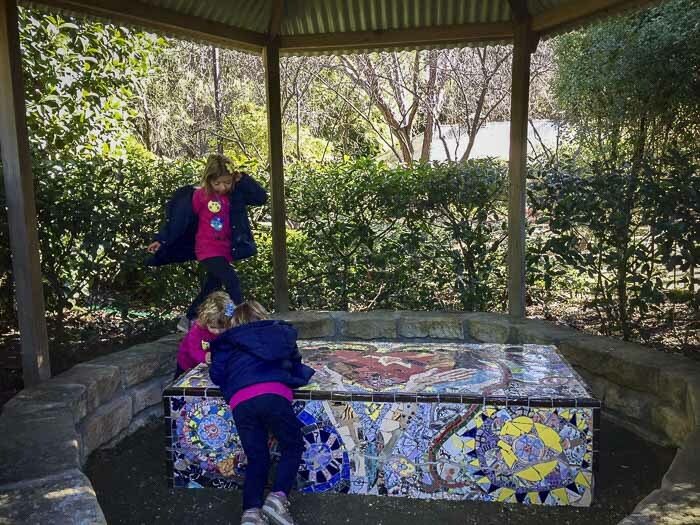 Auburn Botanical Gardens (as the kids call it) is an oasis of serenity in the middle of the vast area of West Sydney. 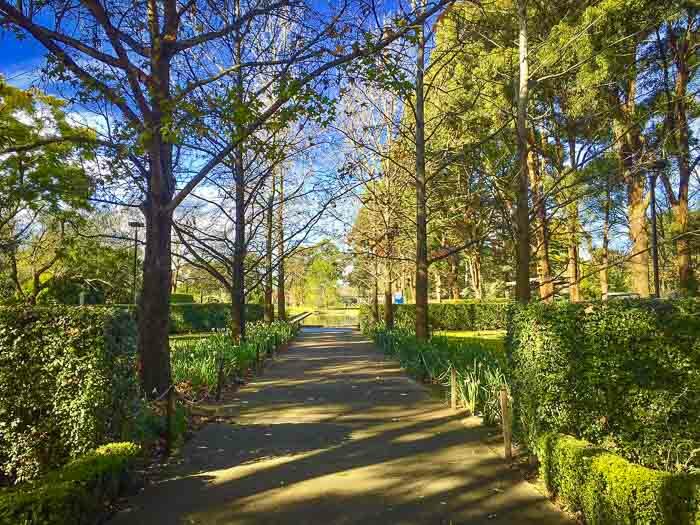 Located 20 km west of Sydney CBD, the Auburn Botanic Gardens cover a surface of 9.2 hectares of land. Our favourite part was the Japanese Garden without a doubt, besides the playground and the fauna reserve. The only part that was disappointing for us was the maze. But this is because we visited the “a-maze-ing” ‘Parc del Laberint’ in Barcelona not long ago, where we couldn’t find our way out! 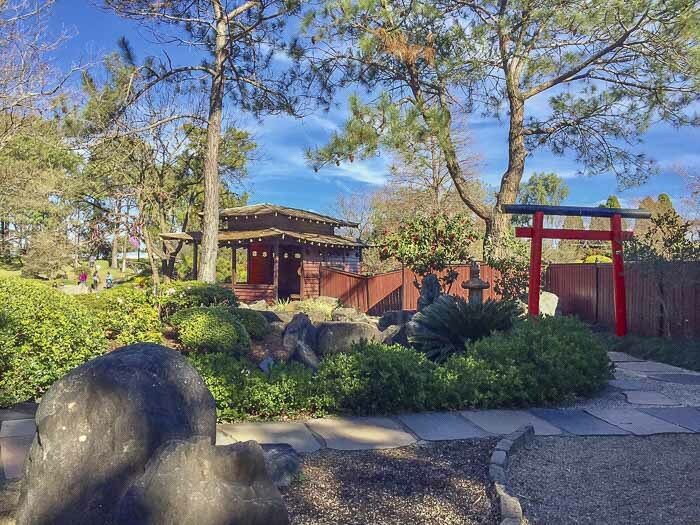 The Auburn Japanese Garden is lovely; even in winter, it was still beautiful. My daughters loved exploring these gardens. 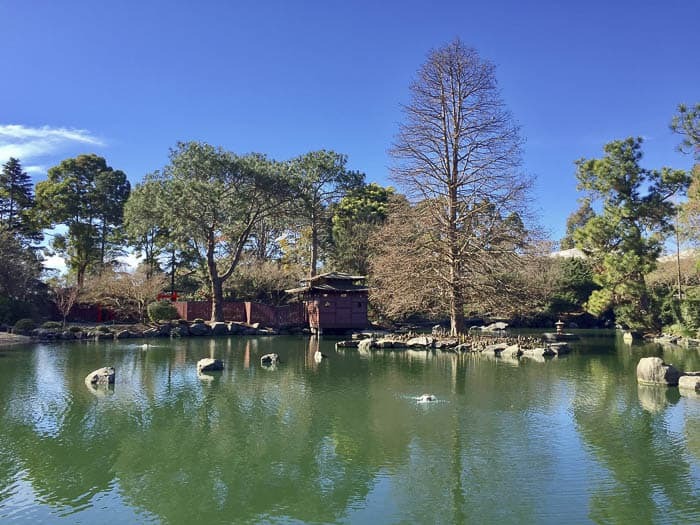 The Japanese Garden Auburn: like a postcard. No filters! I cannot imagine how stunning these gardens could be during the cherry blossom season! We will definitively have to go back when it happens. Check out the info on this annual festival each August below. Exploring the Japanese Gardens Auburn. There is a lake with ducks, geese and koi fish. 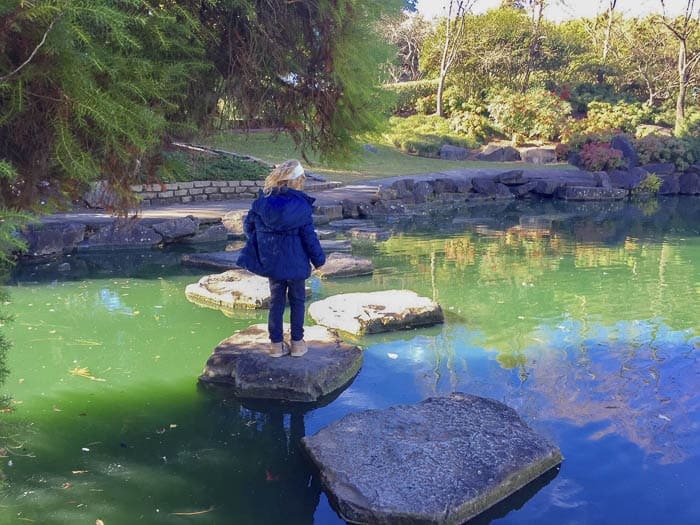 My eldest –in particular- enjoyed walking over the water paths. My little one –of course- loved the ducks and the fish, and my middle one had fun hiding in the teahouse. Where can I hide? Inside the Teahouse? 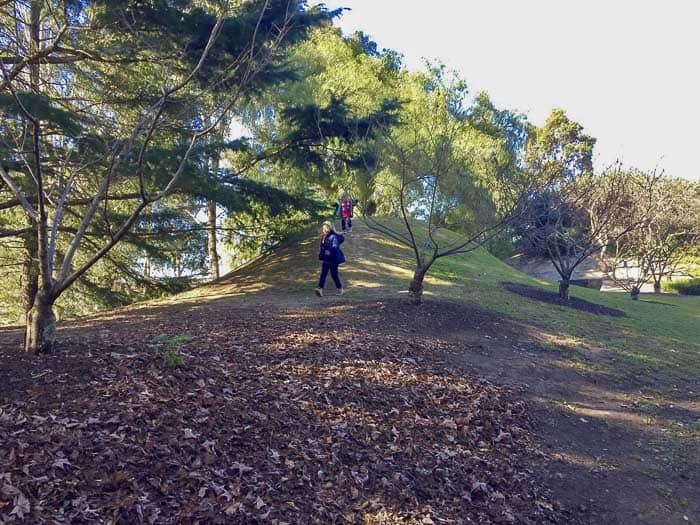 Also, my daughters, who are quite active, had a blast running downhill the symbolic mountains resembling the green hills of Japan. The playground, which is wheelchair accessible, is not massive and it is easy to watch the kids. 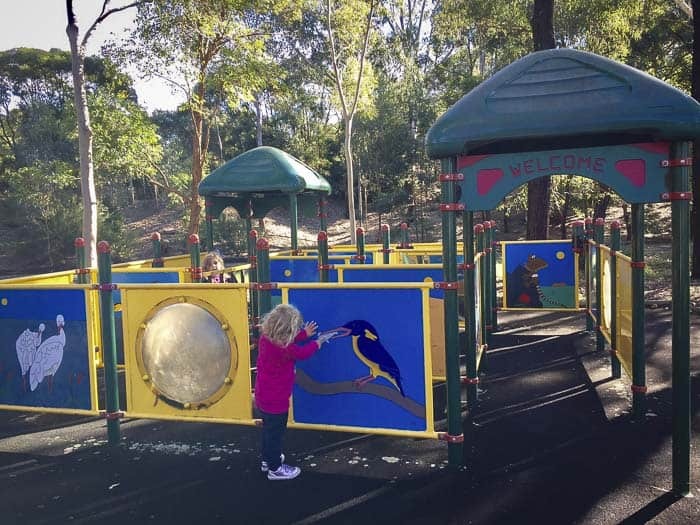 It is designed for mainly early primary school kids. 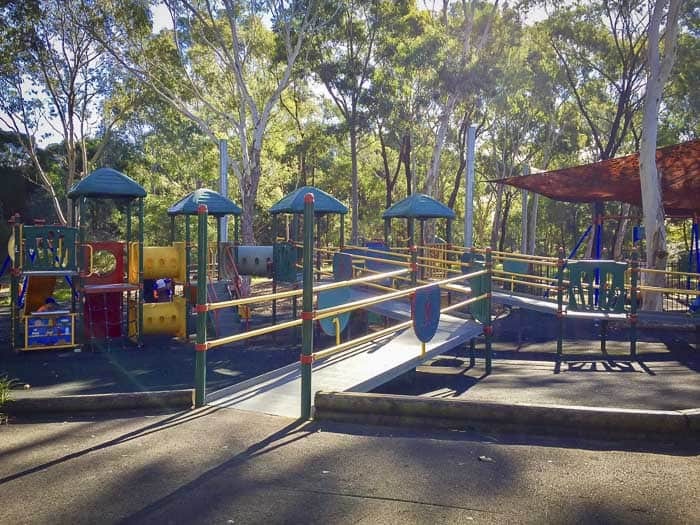 The playground has several footbridges, some swings, a liberty swing, a “maze-like” area (which is not the maze of the Botanical Gardens that is next to the sunken rose garden), a couple of slippery dips and tunnels. But the element that my daughters loved more were the animal sounds that you can hear when you press a button. 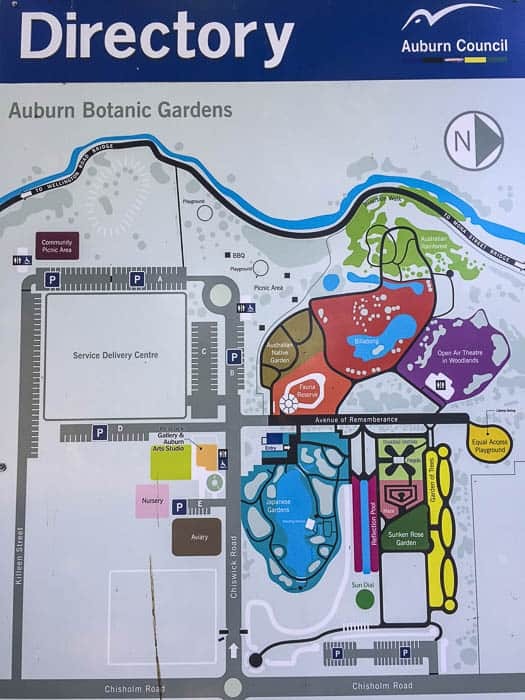 The Auburn Fauna Reserve is well designed and kept. 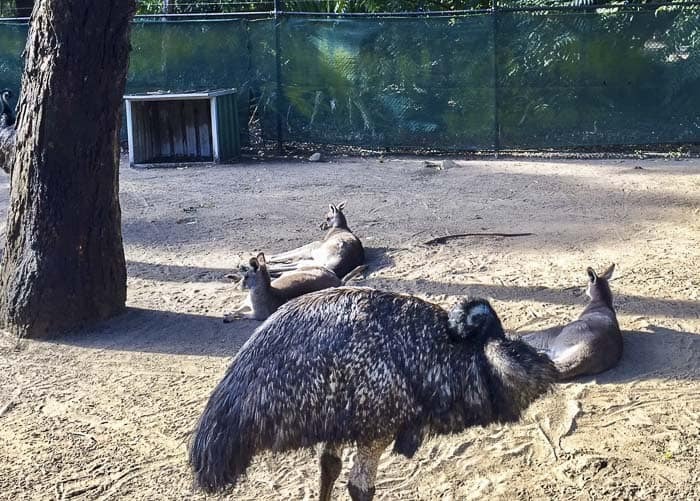 Here you can find native animals such as Eastern Grey Kangaroos, Red-necked Wallabies, Emus, Peacocks or even a wombat (who did not show up when we were in there). 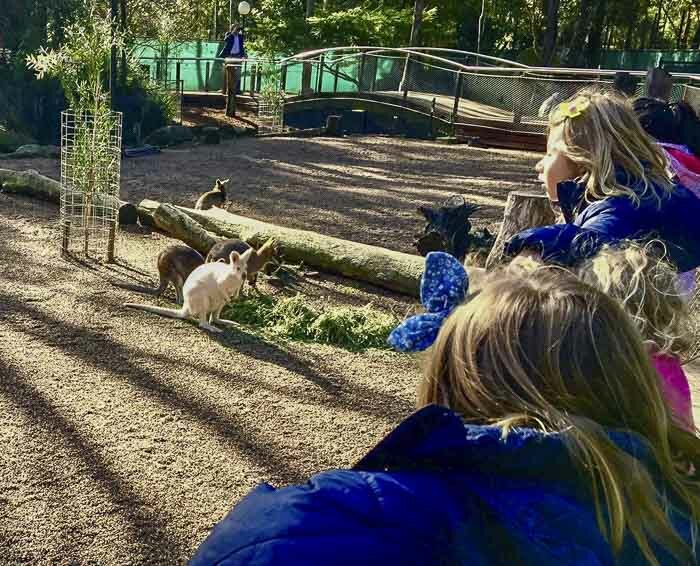 The reserve is accessible for prams and wheel chairs and the design of the enclosures allow children to see the animals well. After such a great morning strolling through the gardens, the fauna reserve was definitively the icing of the cake for my daughters. 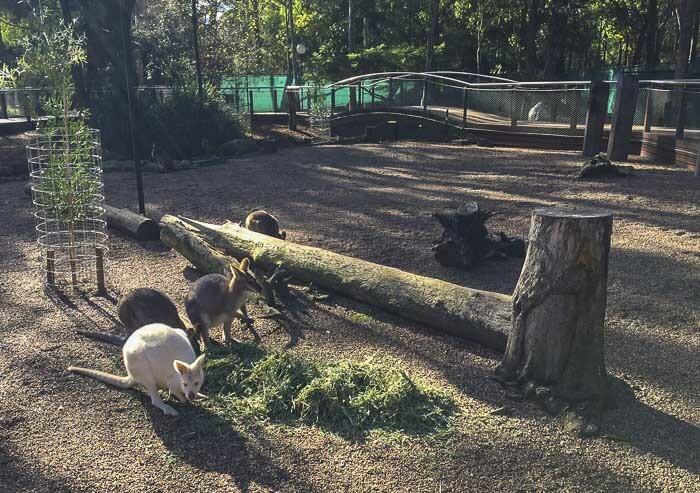 They didn’t expect to find kangaroos in the botanical gardens! 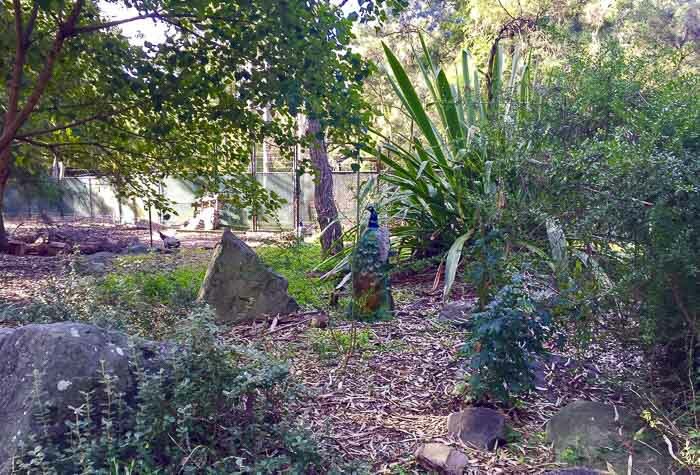 Native Australian Gardens and Rainforest areas: peacock camouflage, can you see him? We also walked through the scented gardens, the rose garden that didn’t have many roses as it was winter, and the Australian native and rainforest area where we spotted a couple of peacocks. Visiting Botanical Gardens is quite therapeutic, and educational, too. Children can walk and run freely, but without hazards. Children can discover new and fascinating plants. The gardens stimulate the senses with colours, the smell of flowers and even, textures. Also, a visit is a good way to teach children how to respect nature in a safe and pleasant environment. You can extend the visit’s pleasures at home by asking your children to draw a picture or making a collage, or a painting if you are ready for a messy afternoon. You will be surprised how much they can enjoy relating the experience of the gardens in their creations! Auburn Botanic Gardens Entry Fee: Free during weekdays. Adults pay $4 at the weekend, except Auburn residents who don’t pay. Kids are always free. Opening hours: 9am to 5pm every day. During day light saving are open until 6pm at the weekend. But always double check on the Facebook page! Toilets: Yes, including disabled toilets. Nearest takeaway coffee: No. This is really a pity! A little kiosk would make Auburn Botanical Gardens the perfect place to chill out and enjoy a beautiful morning. Shade: Plenty. But my advice is to avoid going to Auburn Botanic Gardens in a hot summer day. Western suburbs tend to have higher temperatures than the rest of Sydney as you know and it can be boiling hot without sea breeze. Spring and autumn are the best season to go. Temperature is mild, and the gardens are like an explosion of bright colours. Playground: Yes, there are two playgrounds. One is inside the gardens and the other one is outside, next to the car park and barbecue facilities. This last one is not fenced. The playground inside of the garden has wheelchair accessible equipment, including a liberty swing. 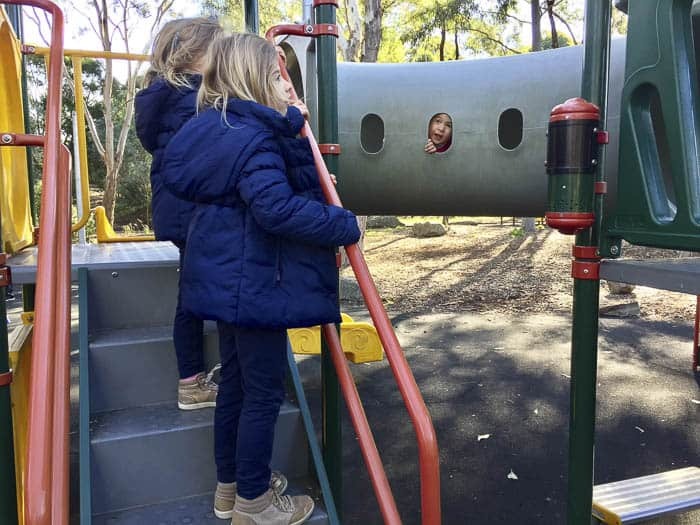 Mum’s report: The botanical gardens Auburn is a great place to explore, especially if you have young children. You can easily spend a couple of hours here. 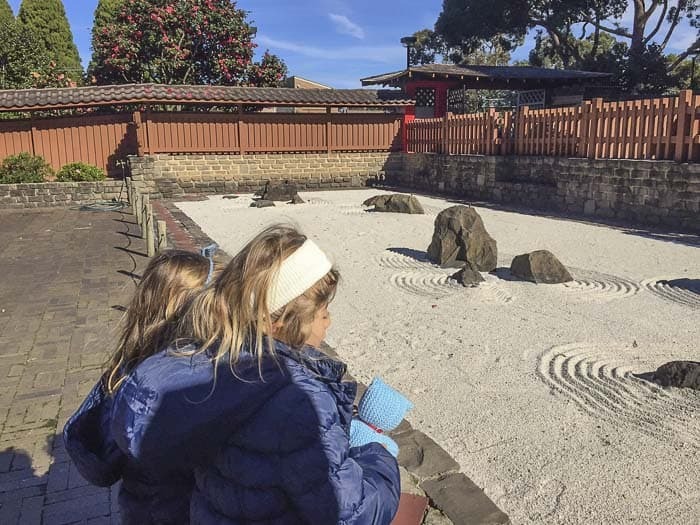 Go first for a walk and discover the beautiful well maintained Japanese Gardens, ask your children if they can smell the different flowers of the Scented Garden such as frangipani and lavender. Then allow them to burn some energy in the playground, and reward them visiting the animal enclosures, which is always a bonus. Extra: Outside the precinct, there is an aviary and an Arts Centre that displays works of local artists. Nearest station: Auburn Train Station, but, it is probably a too long walk to do with little children. From the station, you can take one of the two free shuttle bus services run by Cumberland Council. There is a weekday “Access Loop” service on Tuesday, Wednesday, Thursday and Friday. At weekends, there is a service called the “Rivers and Gardens Loop”. Please, note that the bus doesn’t operate on Monday. For more information, check the bus timetable online or call the Cumberland City Council. Bus stop nearby: Yes, several buses: 909 and S3. Note: always check if there have been changes, before planning your trip. The Auburn Botanical Gardens hosts the Cherry Blossom Festival around mid August. In Japanese culture, the cherry blossom symbolises the fragility of life and its beauty. The festival focuses on the Japanese Culture and old and modern Traditions. 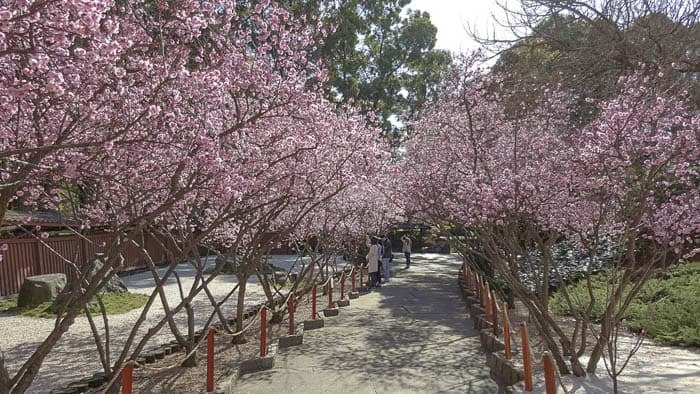 During the Cherry Blossom Festival, you can taste different foods from Japan, learn about flora with the workshops of bonsai and ikebana, watch movies, see some performances and listen to music. Or you can simply walk under the beautiful bright pink canopy of the Auburn Gardens cherry blossoms! The Auburn Botanical Gardens was a great discovery. They are beautiful and they are low cost. Yeah! Sometimes, you don’t need a lot for a happy-exploring morning. My little daughters had definitively a great time. Do you know any other places in Sydney that tick all these boxes? We would love to hear about them. They also have Miss Kitty for the cherry blossom festival. Walking around great for the kids.